As we explored the Sushi Taro osechi boxes, we noticed something new this year. To our delight we found something we really like; cured and dried mullet roe called “Karasumi” からすみ (in the circle below). We also discovered “komochi konbu” 子持ち昆布 (a piece of kelp coated with herring roe) tucked in a small bamboo container (shown on the left). It was dressed in spicy cod roe or “mentaiko” 明太子. These items are indeed the “ultimate delicacy” or “chinmi” 珍味. I briefly grilled the karasumi over a direct gas flame for 10-15 seconds before serving. You can see in the picture that one of the edges is slightly blackened (right piece). The texture and taste of karasumi is difficult to describe but, to me, the closest is a good quality “neri uni” 練り雲丹 or sea urchin salted and processed into paste. Karasumi, however, is much better. The combination of slightly sticky texture, oceanic taste and saltiness goes exquisitely with sake. It provides the ultimate enjoyment of “nibble-a-little-sip-a-little” which is the Japanese way sake is supposed to be enjoyed. A small nibble followed by a sip of sake brings out the perfection of the taste pairing. It can also lead to the consumption of a large amount of sake. 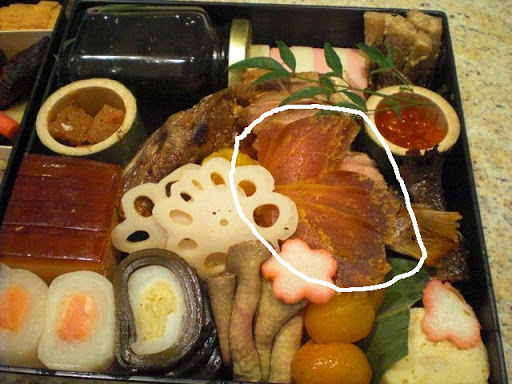 As we amply demonstrated with just these two thin slices of ” karasumi” and one very small block of “komichi konbu”. This karasumi was home-made by Chef Katsuya Kitayama. We had this item sometime ago at a sushi “omakase” dinner at Sushitaro. I initially thought this was not something my wife would like but I was totally wrong. Her karasumi lasted longer than mine since she practiced the slow repetition of nibbles and sips more appropriately and more often than I did. “Karasuki” 唐墨 means “Chinese ink cake”. I am not sure about the origin of the name but the shape of a whole cured and dried mullet egg sac was said to resemble an ink cake imported from China. I was surprise to learn that this item was originally imported from Europe through Nakasaki port (which was the only port open during Edo times). 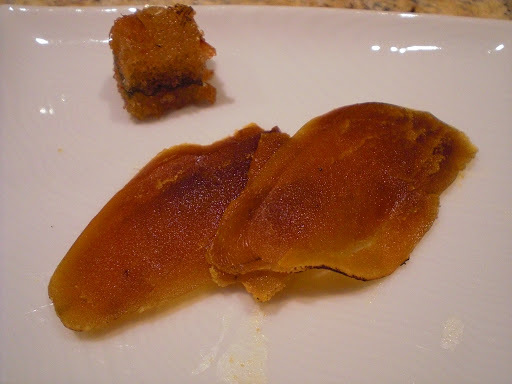 Botargo (or bottarga) is the European counterpart of karasumi, although I have not tasted it. Botargo is famous in Italy, especially Sardinia and Sicily, as well as other Mediterranean countries. (It was actually mentioned in Anthony Bourdain in his episode on Sardinia.) In Japan, the ones produced in Nagasaki 長崎 from mullet roe or “bora” ボラ are the most famous. Apparently similar preparations are made from other fish roe but, again, I have not seen or tasted them. In terms of libations to go with these delicacies, I cannot think of anything better than sake either cold of warm. Sparkling wines such as Procecco may be the next best choice and, maybe, some crisp austere white wine but, for me I’m sticking close to a good sake with karasumi. “Komochi konbu” 子持ち昆布 is another delicacy; a rectangular piece of kelp sandwiched between layers of herring roe. Originally this occurred naturally when wild herring laid their eggs on kelp. Now, however, it is almost never available in its natural form, so most on the market are produced in an aquaculture setting. (I was told Canada is a major producer). I suspect many are “manufactured” by coating the kelp with processed herring roe although I could not confirm this as a fact.This is one of the New Year’s good luck foods since numerous golden colored roe symbolize prosperity (both financially and offspring-wise) and kelp “konbu or kobu” 昆布 is part of the phrase “yoro-kobu” 喜ぶ meaning to rejoice. Katsuya 勝也 dressed this with spicy cod roe “Karashi mentaiko” 辛子明太子 (roe dressed with roe) which raised konochi-konbu to the next higher level. “Karashi mentaiko” 辛子明太子 reportedly originated from Korea and appears popular in the south of Japan; in such cities as Fukuoka 福岡. Certainly it was not popular in Hokkaido when I lived there. It is a spicy red pepper marinated salted cod roe. I usually do not bother buying this but make it from regular cod roe mixed in hot sauce (Tabasco or Sriracha). We enjoyed the Karasuki and komochi konbu immensely. These types of surprises make it so much fun to receive and explore the Sushi Taro osechi boxes. We will remember the joy just these two items brought us for the rest of the year. Thank you Sushi Taro.